No extra parts needed. Patented clip design comes on and off in seconds and requires no additional pieces to attach to your mobile device. FISHEYE LENS - Change your perspective with ultra-wide vision about olloclip The olloclip brand includes a growing line of ground-breaking tools andaccessories for the mobile photographer. Leveraging the phenomenal success ofits flagship product, the 4-IN-1 Photo Lens, the company continues to innovatewith products like the new wearable 4-in-1 lens for iPhone 6 & 6 Plus andother revolutionary products like the Telephoto + CPL lens, Macro 3-IN-1 lensand Quick-Flip case -- all designed to push the parameters of what's possiblein mobile photography. The KickStarter crowdfunding platform inspired founder Patrick O'Neill toevolve his olloclip concept into a reality. Since then, olloclip has attracteda legion of passionate users in just a few years' time, not to mentiondistribution through Apple retail stores worldwide and through leadingretailers across the globe including Amazon. The company remains committed tofinding new and exciting ways to enhance the mobile photography category --and make capturing and sharing life's experiences more fun and creative. 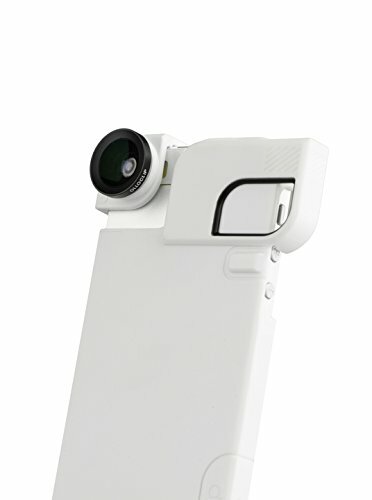 WIDE-ANGLE LENS - Capture it all with nearly double the field of view ORIGINAL 3-IN-1 LENS + QUICK-FLIP CASE iPhone 5/5s This is the quick-connect lens solution that started it all. The Original3-in-1 Photo Lens combines versatility and creativity into one innovativedesign. Combining a Fisheye, Wide-Angle and Macro lens in one lens system thatattaches to your phone in seconds and is sized conveniently to fit in yourpocket. The Quick-Flip Case offers a lightweight, low profile design with easy accessintegration for olloclip photo lenses. The case corner rotates and reveals thecorner of the device to attach the lens - cleverly, the flipped corner thenbecomes a shutter release by activating the "+" button. A removable Pro-PhotoAdapter provides mounting options for tripods, lights, microphones and otherphoto and video accessories. Delivering more than protection, this cleverdesign is a compact photo studio to go. 3-IN-1 Photo Lens Features: Three versatile lens options included: Fisheye Wide-Angle Macro Aircraft-grade aluminum lens housing Precision-ground, coated glass optics No extra parts needed. Patented clip design comes on and off in seconds and requires no additional pieces to attach to your mobile device. Quick-Flip Case Features: Lightweight, low profile protection Quick-Flip corner to easily attach olloclip photo lenses Integrated shutter release by activating the "+"button Removable Pro-Photo Adapter for mounting tripods, lights, microphones and other accessories Size matters. The real challenge is introduced when innovating quality optics in a compactand lightweight form factor. That's why at olloclip we've created acollection of beautifully designed, easy-to-use mobile lens systems with nooversized, heavy lenses or the need for extra parts like a bulky case ormounting bracket - just the way a mobile photographer would expect it. Like lenses used on larger professional DSLR cameras, this olloclip lenssystem is designed specifically for iPhone to provide similar perspectives andis sized small enough to fit in a pocket, purse or hand. And because ofolloclip's award-winning design, the lens system clips on and off your devicein seconds. Simply attach the lens to your iPhone and unleash yourcreativity. Made in U.S.A. Our in-house engineering and design teams spend countless hours perfecting theultimate user experience with un-compromised quality. The pocket-sized,patented design works on both the rear-facing camera and the front FaceTimecamera, so you can let your photos and selfies run wild. Plus, it comes with3 wearable pendants to keep your lens easily accessible on your keychain,backpack, handbag... or anywhere you want it within arm's reach. Because thebest camera is the one that's always with you. PRODUCT SPECS: 3-IN-1 Photo Lens Technical Specs: Height: 1.57 inches Width: .98 inches Depth: .98 inches Weight: .6 ounces Quick-Flip Case Technical Specs: Height: 5 inches Width: 2.43 inches Depth: 0.45 inches Weight: 1.5 ounces olloclip press releases olloclip Celebrates Award-Winning Month Across the Globe and Gets Ready foriPhone 6 Launch Honored with Five Awards from _CEA,__USA Today, Tom's Guide, Orange County Register "Best of OC" and Envisioneering Innovation and Design Honoree Award for ShowStoppers at IFA._ HUNTINGTON BEACH, CALIF - October 06, 2014 - olloclip the creator of easy-to-use mobile photography tools, has been honored to receive five awards fromaround the world in the past month. olloclip was awarded by _The ConsumerElectronics Association (CEA), __USA Today's __10Best__, Tom's Guide, OrangeCounty Register "Best of OC" and Envisioneering Innovation and Design HonoreeAward for ShowStoppers at IFA._ The Consumer Electronics Association (CEA) Innovation Entrepreneur Award (IEA) - has honored olloclip as the _Small Business of the Year._ The award recognizes businesses with revenues under $30 million and the contributions they make to the U.S. economy. The honorees were announced October 1, 2014 during the keynote luncheon at CEA's Innovate! conference. "This year's Innovation Entrepreneur Award winners demonstrate the tenacityand drive that is needed for entrepreneurs to thrive in today's consumerelectronics industry," said Gary Shapiro, CEA's president and CEO. "Since itslaunch three years ago, olloclip, winner of the Small Business of the YearAward, created an entirely new accessories category and gave mobilephotographers the lens experience of a DSLR in the palm of their hands." USA Today's 10 Best Readers' Choice Award for Best App/Gadget for Phone Pics chose the olloclip 4-in-1 Photo Lens System as the top winner of the category. Nominees for Best App/Gadget for Phone Pics were chosen by a panel of relevant experts which include a combination of editors from USA TODAY, editors from 10Best, relevant expert contributors and sources from both these media and other Gannett properties. The public then voted for their favorite nominee.